Metal rectangular wool bale stencil. Stencil has cutouts of a sheep head symbol on left side and the number '83' and 'PI' on either side of an Australia shape on the top right. There are three horizontal rectangles below this, and below them is the number 54719. Faintly engraved at the top is the text AWC PROPERTY / NOT TRANSFERABLE. Rear of stencil is a shiny light metallic colour. Front side is scratched and stained, particularly around the text areas. This would be due to use. Associated envelope is worn and becoming frail. It is a cream colour with heavy staining and opened on the right side. Top left has a printed return address, top right has a stamp area. Affixed postal address is for the donor and that is above a blue stamped text reading IMPORTANT / DO NOT BEND. Back of envelope has a stamped print of the stencil and another bright red stamp. Possibly put there by the donor. Wool bale stencil owned and used by donor. 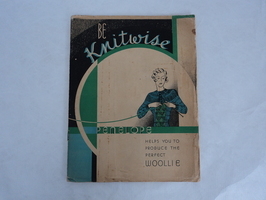 Donor was a wool classer in New South Wales working from the 1960s to c2000. This stencil was used by the donor as they traveled from station to station and was used to stencil their registration number on the bales of wool that they had classed. The stencil was created by the Australian Wool Corporation who mailed the stencil to the donor. We also have the original envelope.